I’ve got two exciting contests to share with my American readers today! 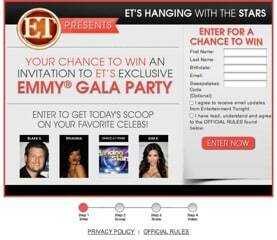 The first one is the ET’s Hanging with the Stars Sweepstakes where you can win an invite to ET’s Exclusive Emmy Gala Party in Los Angeles, CA on September 23! You will receive round-trip air transportation for you and one guest as well as two nights hotel accomodation. At the party itself, you and your guest will be able to walk the Red Carpet and will sit in the VIP Section during the music performance at the party. The value of this prize package is approximately $2200! In addition to the Grand Prize, there’s also weekly and daily prizes! The Weekly Prizes (8 in total) are a 10 to15 minute private, off-air call with one of Entertainment Tonight’s show talent: Mark Steines or Nancy O’Dell. The Daily Prizes (20 in total) are to have your first name and last initial on Entertainment Tonight in an on-air graphic within the ticker, bumper or end credit. To earn extra entries, share with your friends via Twitter, Facebook and/or Email. For each friend that enters using your unique url (which you will receive after you enter), you will earn one extra entry! The sweepstakes is open to US only and ends May 24, 2012. Please read the official rules and regulations. The second one is The Insiders Hanging with the Stars Sweepstakes where you can win an invite to The Insider’s Exclusive Emmy Gala Party in Los Angeles, CA on September 23! You will receive round-trip air transportation for you and one guest as well as two nights hotel accomodation. At the party itself, you and your guest will be able to walk the Red Carpet and will sit in the VIP Section during the music performance at the party. The value of this prize package is approximately $2200! The Weekly Prizes (6 in total) are a 10 to15 minute private, off-air call with one of the Insider’s hosts: Kevin Frasier or Brooke Anderson. The Daily Prizes (21 in total) are to have your first name and last initial on The Insider in an on-air graphic within the ticker, bumper or end credit.